What is the Bury Bible? 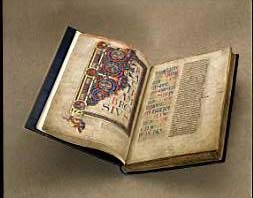 The Bury Bible is a hand written and illuminated Bible of the type used by the church before the English Reformation. It was originally bound in two great volumes, and is of a great size, compared to books of today. Each page measures 52.5cm by 35 cm and represents just about the largest size page that could be won from a whole calfskin of the time, using a double page per skin. It needed about 350 skins in all. The written space covers 38 cm by 23.5 cm, in two columns of 42 lines. What remains today is just the first volume of the great book, ending at the Book of Job. The remaining volume is lost, and is assumed to have been destroyed. What we have has been rebound over the years, and at its last re-binding in 1956, the single volume was made into the three volumes that survive today. There are 357 pages in all still remaining, and example pages and the illuminated pages and initials can be seen on this website in the Bury Bible Picture Gallery. Many of the decorations were done on separate pieces of parchment, glued to the page before painting. Six framed miniatures survive from the original twelve in this volume. Forty-two initials in gold and colour survive from an original forty-four.